Heat oven to 350°F. Spray with nonstick cooking spray or grease bottom only of 13x9-inch pan. In large bowl, combine brownie mixes, chocolate pouches from mixes, oil, water and eggs; beat 50 strokes with spoon. Pour about half of batter into sprayed pan. In large saucepan, combine condensed milk, peanut butter chips and peanut butter; cook over low heat for 5 minutes or until chips and peanut butter are melted, stirring constantly. Spoon and spread peanut butter mixture over batter. Drop remaining half of batter over peanut butter layer. Sprinkle with chopped peanuts. Bake at 350°F. for 35 to 40 minutes or until edges begin to pull away from sides of pan. DO NOT OVERBAKE. Cool 2 hours. Refrigerate 1 1/2 hours or until completely cooled before serving. Cut into bars. These brownies are practical for summer potlucks because there is no frosting to melt in the sun. 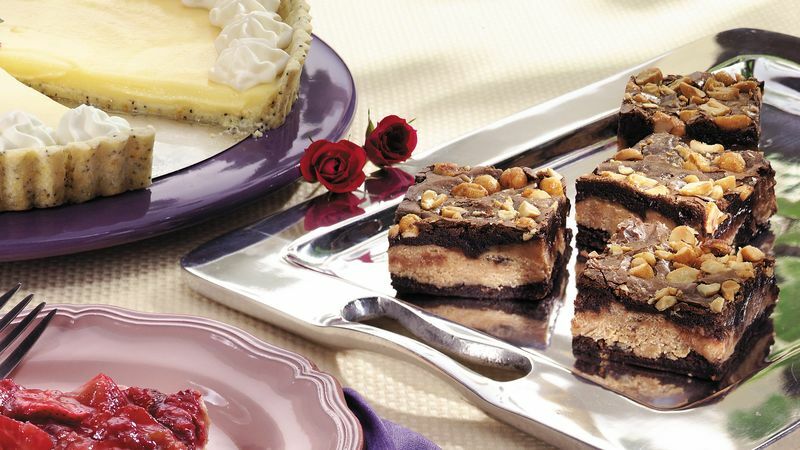 Honey-roasted peanuts add crunchy texture and lots of peanut flavor to these brownies. To cut neat, even brownies, first line the pan with aluminum foil, leaving a few inches of foil extending above the edge of the pan. Lightly coat the foil with nonstick cooking spray. When the brownies cool, grasp the extra inches of foil and lift it from pan. Peel the foil away and place the brownies on a cutting board. Use a long knife to cut the brownies into bars.